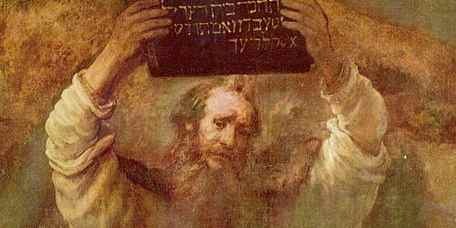 Most contemporary courses in theology teach that Moses was not the author-redactor of the first five books of the Bible and that these books were cobbled together by scribes many centuries after the time of Moses. However, from the time of the Apostles until now, the Fathers, Doctors, Popes and Council Fathers, in their authoritative teaching, have believed and taught that Moses wrote or redacted the first five books of the Bible. Indeed, from the beginning to the end of the Bible, book after book states repeatedly that Moses “wrote” at God’s command. Jesus Christ, the Eternal Word Himself, declared categorically: “If you believed Moses, you would believe Me, for he wrote of Me” (John 5:46). Thus, it is no surprise to discover that the evolution revolution began with an all-out assault on the Mosaic authorship-redaction of the Pentateuch, since the invalidation of that traditional teaching would necessarily call into question the credibility of Sacred Scripture and of Our Lord Himself. Drawing upon currently-available scholarship, this article will demonstrate that the successful campaign to discredit the Mosaic authorship of the Pentateuch at the end of the nineteenth century was actually based on conjectures, supported by a smattering of circumstantial evidence, but ultimately crushed under the weight of new and conclusive findings. All the other prophets spoke either of what was to occur after a long time or of what was about to happen then; but he, the blessed (Moses), who lived many generations after (the creation of the world), was vouchsafed by the guidance of the right hand of the Most High to utter what had been done by the Lord before his own birth. The man who is made equal to the angels, being considered worthy of the sight of God face to face, [who] reports to us those things which he heard from God. It is for this reason that he begins to speak thus: “In the beginning God created the heaven and the earth,” as if calling out to us all with a loud voice: it is not by the instruction of men that I say this; He Who called them (heaven and earth) out of non-being into being—it is He Who has roused my tongue to relate of them. And therefore I entreat you, let us pay heed to these words as if we heard not Moses but the very Lord of the universe Who speaks through the tongue of Moses, and let us take leave for good of our own opinions. Unfortunately, with the evolution revolution of the nineteenth century, many Catholic scholars began to exalt the “opinions” of men above God’s revelation to Moses on the grounds that the young science of archaeology had proven that Moses could not have written or redacted the first five books of the Bible as the Fathers had believed. The strongest “proof” that emerged from the excavations of nineteenth century archaeologists was negative. According to German scholar Julius Wellhausen, the absence of evidence of writing in the time of Moses contradicted the traditional Christian teaching that Moses had been the writer or redactor of the first five books of the Bible. If there was no writing in the time of Moses, Wellhausen reasoned, Moses could not have written anything. In addition, Wellhausen and his school pointed to other anomalies. The author(s) of the Pentateuch wrote of kings; but there were no kings in the time of Moses. The author(s) of Genesis described domesticated camels in the time of Abraham—but archaeology had not unearthed any evidence of camels having been domesticated in the time of Abraham. Moreover, the author of Exodus referred to Philistines in the time of Moses; but the Philistines were not a great military power in the time of Moses. Thus, it seemed clear to Wellhausen and to most of the intellectual elite of Europe and North America that Moses could not have been the author or editor of the first five books of the Bible. Tragically, a host of Catholic scholars jumped on the Wellhausen bandwagon, forgetting that “absence of evidence” is not necessarily “evidence of absence.” Pope Leo XIII and Pope St. Pius X refused to abandon the traditional teaching of the Church on the Mosaic authorship of the Pentateuch, however; and, in 1906, the Pontifical Biblical Commission, then an arm of the Magisterium, formally upheld the Mosaic authorship of the Pentateuch in an official decree. 1. Authenticity — Whether the arguments amassed by critics to impugn the Mosaic authenticity of the sacred books designated by the name Pentateuch are of sufficient weight, notwithstanding the very many evidences to the contrary contained in both Testaments, taken collectively, the persistent agreement of the Jewish people, the constant tradition of the Church, and internal arguments derived from the text itself, to justify the statement that these books have not Moses for their author but have been complied from sources for the most part posterior to the time of Moses. 2. Writer — Whether the Mosaic authenticity of the Pentateuch necessarily postulates such a redaction of the whole work as to render it absolutely imperative to maintain that Moses wrote with his own hand or dictated to amanuenses all and everything contained in it; or whether it is possible to admit the hypothesis of those who think that he entrusted the composition of the work itself, conceived by himself under the influence of divine inspiration, to some other person or persons, but in such a manner that they render faithfully his own thoughts, wrote nothing contrary to his will, and omitted nothing; and that the work thus produced, approved by Moses as the principal and inspired uthor, was made public under his name. Answer: In the negative to the first part, in the affirmative to the second part. 3. Sources — Whether it may be granted, without prejudice to the Mosaic authenticity of the Pentateuch, that Moses employed sources in the production of his work, i.e., written documents or oral traditions, from which, to suit his special purpose and under the influence of divine inspiration, he selected some things and inserted them in his work, either literally or in substance, summarized or amplified. 4. Changes and Textual Corruptions — Whether, granted the substantial Mosaic authenticity and the integrity of the Pentateuch, it may be admitted that in the long course of centuries some modifications have been introduced into the work, such as additions after the death of Moses, either appended by an inspired author or inserted into the text as glosses and explanations; certain words and forms translated from the ancient language to a more recent language, and finally, faulty readings to be ascribed to the error of amanuenses, concerning which it is lawful to investigate and judge according to the laws of criticism. Answer: In the affirmative, subject to the judgment of the Church. As demonstrated by Fr. Sean Kopczynski in his article “Rediscovering the Decrees of the Pontifical Biblical Commission,” ( LivingTradition, No. 94, July 2001), no subsequent magisterial decree of equal or greater authority has ever superseded the PBC responses on the Mosaic authorship of the Pentateuch. Moreover, the wisdom and accuracy of the PBC’s responses has been thoroughly vindicated by subsequent archaeological discoveries which have proved that writing existed one thousand years before the time of Moses, that camels were domesticated in the time of Abraham, and that the Philistines truly existed in the time of Moses, though not as the great military power that they would become in the period of the Judges. Indeed, as scholars have studied the text of the Pentateuch more deeply, they have discovered linguistic singularities that confirm the traditional teaching of the Church on the Mosaic authorship and redaction of these five books. It is now generally recognized that the first five books of the Bible—and only these books—contain what is called the “epicene personal pronoun,” a pronoun without a gender. For example, in the first prediction of the Messiah, in Genesis 3:15, God says to Satan, “I will put enmity between you and the Woman, and between your seed and her seed.” But does the text then say: “He will crush your head,” “She will crush your head,” or “It will crush your head”? The use of the epicene personal pronoun keeps one from translating the text correctly, outside of the authentic tradition of the Church. And that is why St. Jerome was able to translate the pronoun correctly—“Ipsa conteret”—“She will crush your head,” a translation whose accuracy was later confirmed by the tilma of Our Lady of Guadalupe standing on the crescent moon, symbol of the serpent god Quetzacoatl, and by Our Lady of the Miraculous Medal, who appeared to St. Catherine Laboure’ with the serpent-symbol of Satan beneath her feet. Further study of the Pentateuch also revealed that the text is full of Hebrew words that have been brought into Hebrew from the Egyptian language, words which appear nowhere else in the Old Testament. Thus, the Wellhausen hypothesis which had taken most of academia by storm at the end of the nineteenth century proved to have been based on nothing more than wild speculation supported by a smattering of inconclusive evidence. Throughout salvation history, God’s people have had to struggle against the temptation to be “like the nations,” and, in so doing, to break faith with their Creator and Redeemer. In the days of Elijah, most of the leaders of Israel practiced or tolerated the worship of Baal. During the last 150 years, many Catholic theologians and Church leaders have embraced or tolerated theistic evolution. During this entire period, a series of alleged “proofs” for evolution has been uncritically accepted by leading Catholic intellectuals—“proofs” like embryonic recapitulation, “vestigial” organs, and “junk” DNA—while dissenting voices, like those of St. Maximilian Kolbe and Dietrich Von Hildebrand, have gone largely unheeded. Now that each and every one of these “proofs” for evolution has turned out to be just as flimsy as the “proof” for the Wellhausen hypothesis, it is high time that the Magisterium put a stop to this madness. It is time to give the traditional teaching of the Church the respect that it is due and to place the heavy burden of proof on those who question the traditional Catholic interpretation of Genesis 1-11. In short, it is time to return to the Faith of our Fathers—to trust in God’s Word as It has been handed down to us in the Church—and to stop treating skeptics seriously who cannot even begin to demonstrate that “reason dictates or necessity requires” that we abandon God’s Word for their wild speculations! St. John Chrysostom, Homilies on Genesis, 2:2. St. Ambrose of Milan, Hexaemeron, 1:2. St. Basil the Great, Hexaemeron, 1:1.